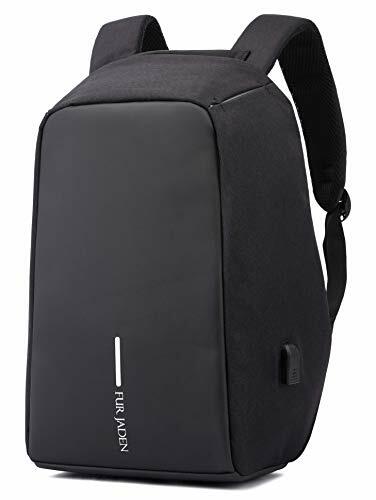 KEY FEATURES - Black Colour Backpack for Men and Women for Stylish Office use as well as for Trendy College students. Huge compartment size that can fit upto a 15.6 inch Laptop with ease. Multiple pockets for other accessories. Charging On the Go - With our attached charging dock, now charing on the go with your Portable Charger is now easier than ever before. Packaging - We've adopted a 4 Layered Packaging System to ensure our bags reaches you without a single scratch. All our bags are first wrapped in soft tissue material bags which is then layered with a plastic bag. These are then placed in our Fur Jaden Branded Tissue Bag. This is finally placed in the courier bag and shipped to you with lots of care. Essence of Fur Jaden - We craft signature Laptop Backpacks and Casual Backpacks that are young, vibrant and fashionable, and yet a celebration of timeless style, luxe and sophistication. We strive to make thoughtful designs that are high on aesthetics as well as on utility and functionality.